Apologies:- Anisa K., Joe W., Jasmine R., Khadiija A.
Samah started off the meeting with Lightning Talks, which were taken by Jade C., Katie R. and Melissa D.
MENTAL HEALTH CONSULTATIONConsultation is when members of an organisation gather information/feedback from members of the public or group on a project or scheme. Jodie ran a consultationConsultation is when members of an organisation gather information/feedback from members of the public or group on a project or scheme. on the different issues regarding mental issues, looking at subjects such as the stigma behind it. Youth Councillors were asked to look through a series of issues to focus on. Out of the issues, Youth Councillors were asked to rank their top three issues on importance in their opinion. 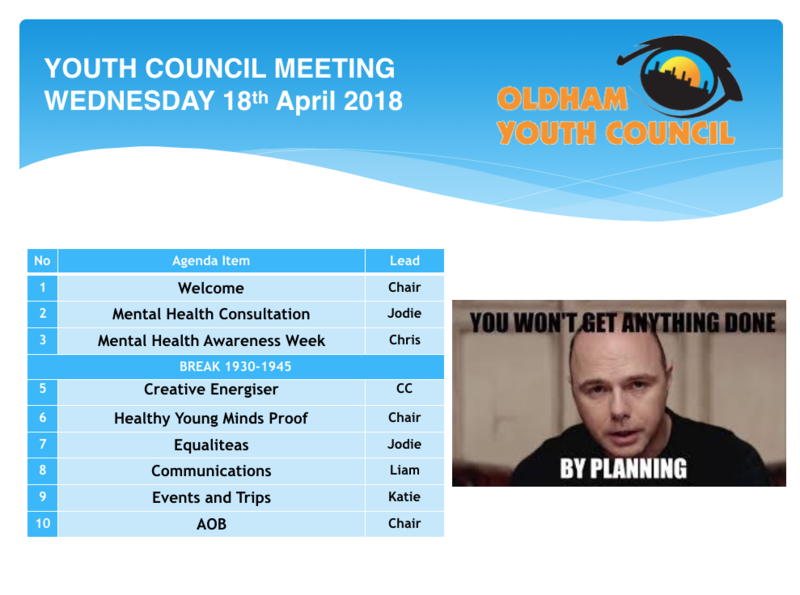 With Mental Health week on 14-21st May, Oldham Youth Council will be doing a social media campaign with images that represent Young People’s mental health in different situations. The pictures, which were done with the tremendous help of Emma Cammack, will be sent out on social media but needed captions/hashtags to accompany the images. Every meeting, members of the Creativity Counsel will run a five minute workshop to energise youth councillors back into the meeting, and produce something creative. A document on the information retained by Healthy Young Minds was proofread by members of the Youth Council. This was to check that the text was youth friendly, and that spelling mistakes and unneeded words weren’t in the document. Dates for Events and Trips were given out to youth councillors.